Club Member Prashant Mistry scored an impressive win at last weeks North Shore Open, taking out the B division with a perfect score of 6 from 6. 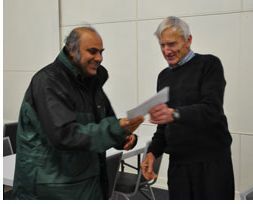 Prashant collected a sizable monetary prize for his efforts. Well done. Club welcomes Paul Dalley as a member. Paul is the club’s newest member. He has played 26 rated games so far and enters the club rating list on 1483 points.Welcome Paul. Richard Dare and Joel Crombie are the club Rapid Champions for 2015, both coming through their respective tournaments with perfect 6 out of 6. Joel wins a book prize for his efforts. Sean and Jeff came second and third respectively in the Junior division with Stefan and Christopher second and third in the open. Final crosstables are here. The Previous Champions page has been updated also. We had round five of the club Rapid Champs last night. Joel now has an unassailable lead in the Junior section so will claim the book prize for Juniors. Stefan can potentially still tie for first place with Richard in the open, although the real race is for the minor placings. Final round next week. Games kick off at 730pm. Be there by 7:20 or you wont make the draw. Junior pickup at 8:15 please. We had two new juniors (Alex Liu, and Geon Choi) and an adult (John Chin) sign up as new members last night. All three have been included on the updated statistics page. Welcome. The club rapid tournament resumes at round five next week. We will have one game per week at 25 + 5 time control. Rember we will have a book prize for the winner of the Junior division. As there is only one organized game on the night pickup for Juniors will be around 8:15 please. Note that this is a members only event. You can join the club on the night and play out the remaining two rounds of the tournament if you wish. The crosstable after the first four rounds can be found here.